Something I’ve been making for absolutely years and adore is potato rosti. It’s cheap as chips, and so tasty. You can use up old potatoes and onion and add any other bits and pieces you have coming to the end of their lives in the back of the kitchen cupboard! I hadn’t made it for a little while when my vegan friend Anna mentioned it the other day so I whipped up the one above. 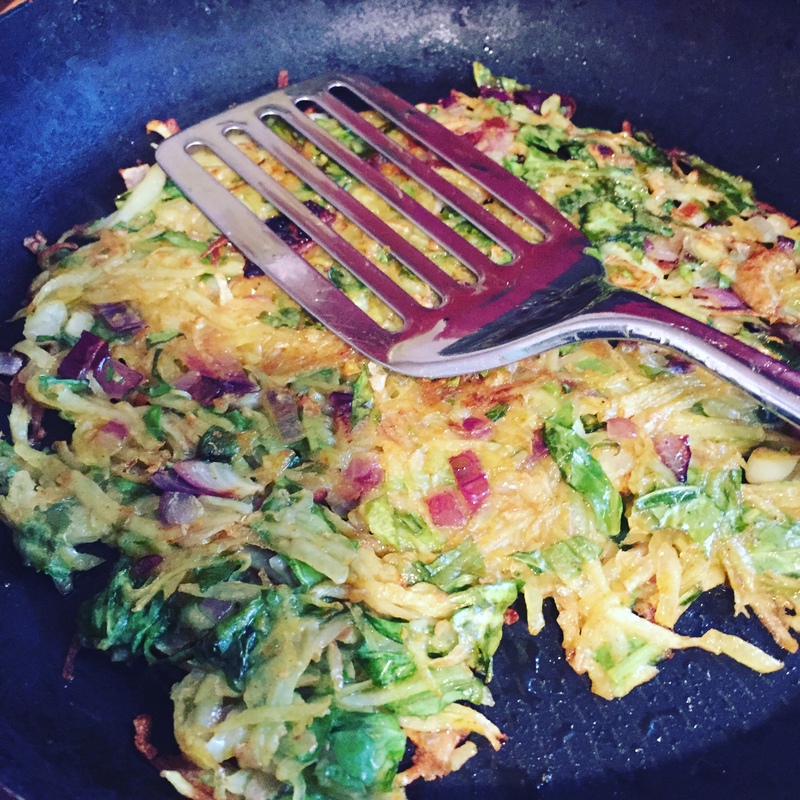 But first… there are many different ways to make rosti depending on where you live! A few years ago we had the most lovely au pair from the Czech Republic stay with us for the summer. I made Alena my rosti one day and she was ever so polite but it wasn’t what she was used to back home (sorry Alena!). So I challenged her to make me her version (with boiled mashed up potatoes) which was really quite different and I returned the polite comments but it wasn’t for me. So this is my version…let me know what you think in the comments below. I use one medium to large potato for one rosti. How much you make depends if you’re having it with anything like I did the other day (above). 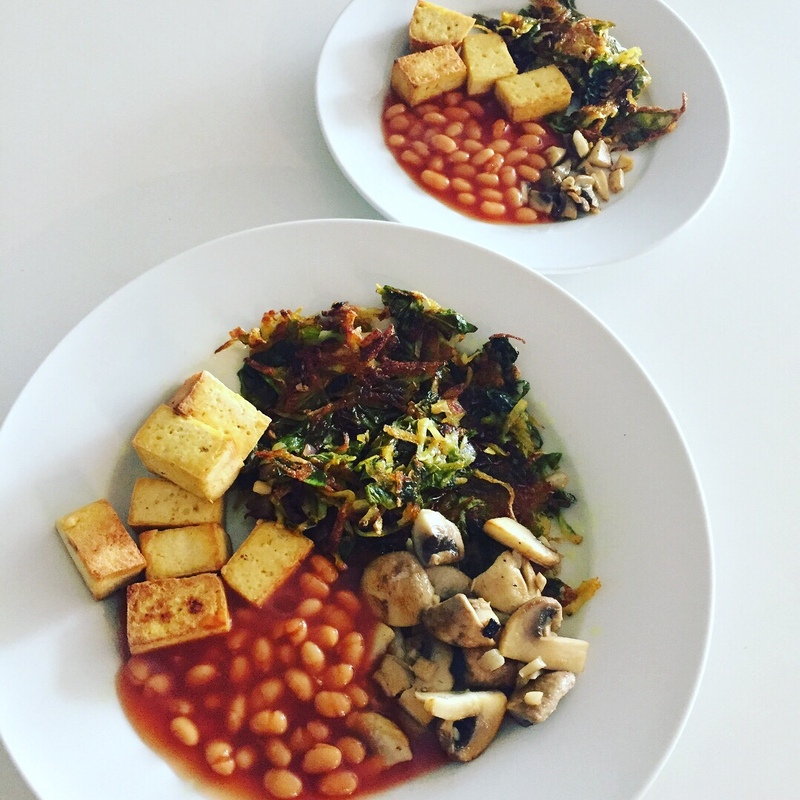 I had my rosti with tofu, mushrooms and beans so I used a large sized potato and this was shared with my toddler (below) with his own little version! Grate your potato (on a course grate not fine! 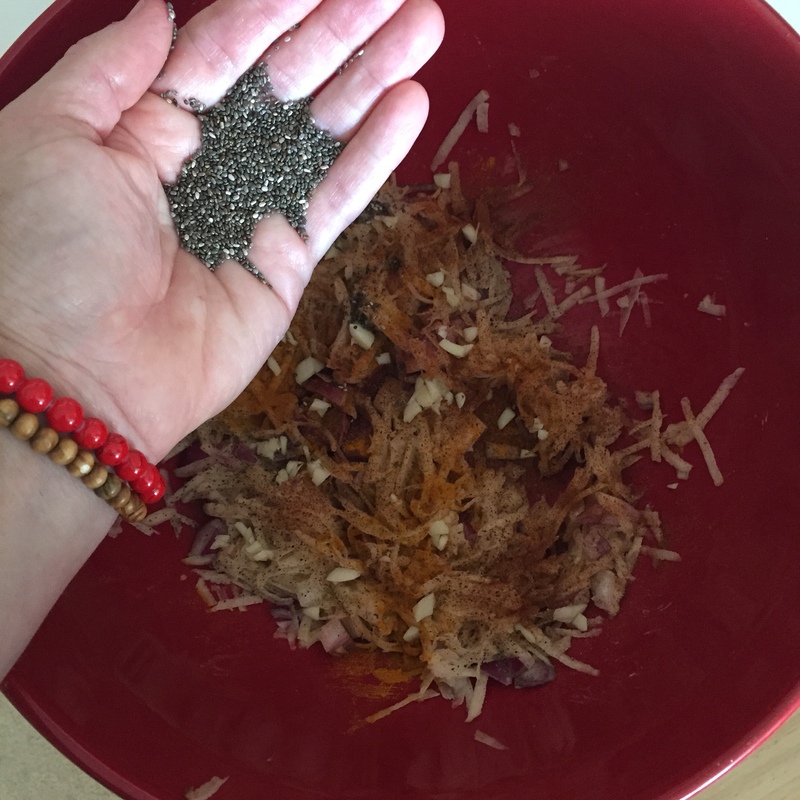 ), chop an onion and some garlic finely then mix it all up in a bowl (I use my fingers!) with a good amount of salt and pepper and any extra spices you fancy. I use turmeric & cayenne. I also added finely chopped spinach from my allotment to this one. You can add chia seeds or flaxseed too to get that extra omega 3 hit! Mix it all up well. Then heat up your oil in a frying pan and add the rosti mixture. Flatten it down well so it sort of all meshes together. Fry on low – medium heat for 5-10 mins. This bit is quite important because you need it to start changing colour at the edges and smell the potato cooking BEFORE you flip it over. If you turn it too early or it’s too thin (it needs to be at least half a centimetre thick) it’s likely to fall apart. This is not the end of the world however but it’s quite satisfying when it all stays together in a circle. You can lift a little bit up at the edge and have a peek before you flip it. Don’t be tempted to turn up the heat too much as it will just burn on the outside and not cook in the middle and it does take 15 – 20 mins to cook as it is raw potato so it needs to cook through. This is a pic (below) of a mixture before it’s mixed up and goes in the pan. 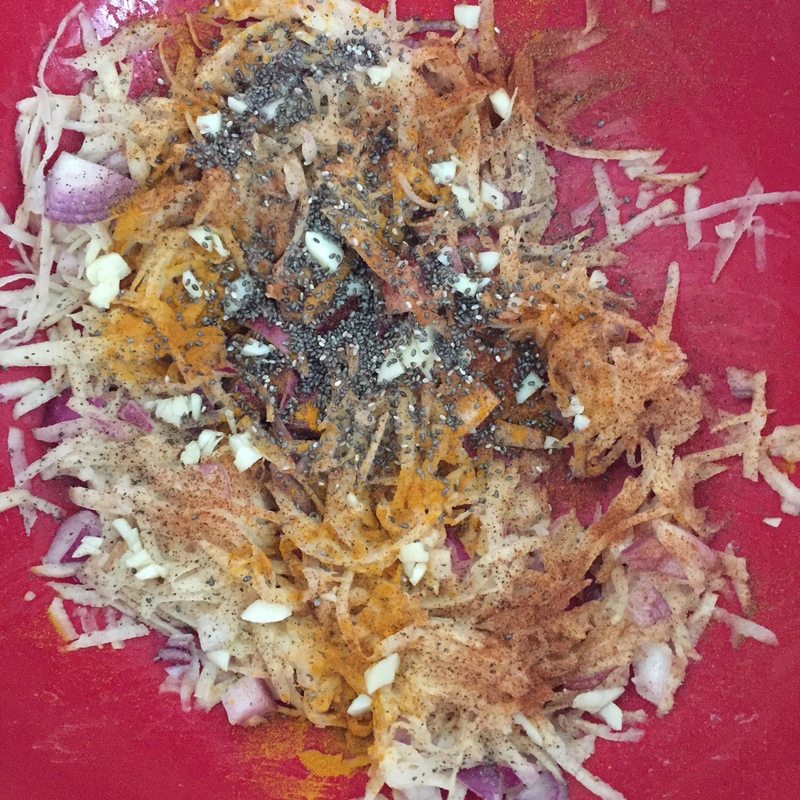 I think I grated one sweet potato and one white potato in this one and it was really good. And please do get in touch if you’d like me to review your vegan products. Sounds lovely. Love any potato recipes especially in Autumn/Winter. You can’t go wrong with a spud! 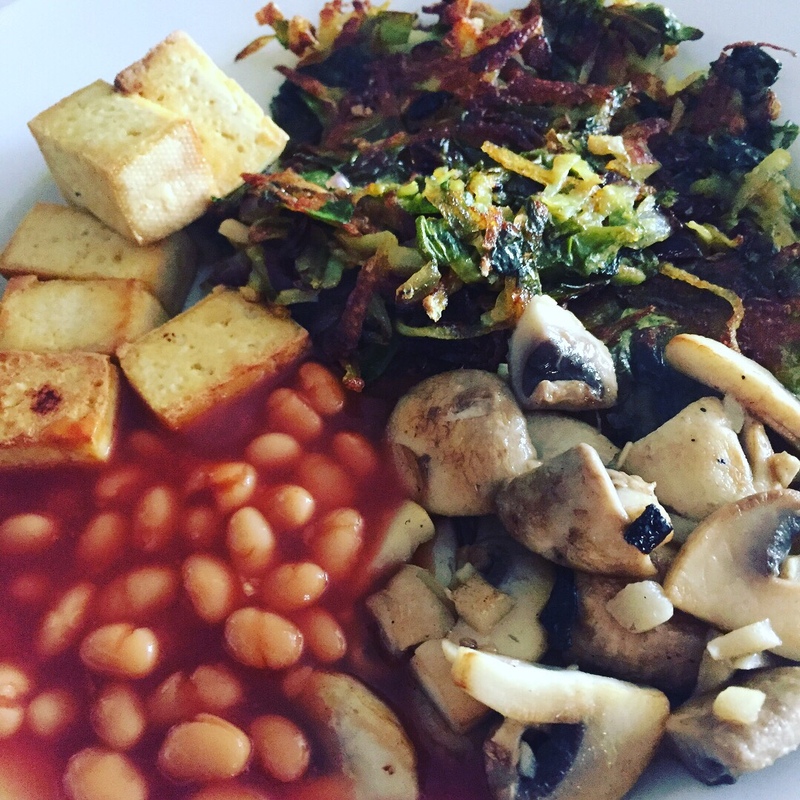 Love rostis – definitely should be made using grated potato (surely otherwise it’s just a potato cake!) . Might attempt to have a go at potato/carrot/garlic rostis in the airfryer and see how that works. Ooh let me know how that goes! I love these when other people cook them! I never have much success but will try again as they look so good! Very tasty too! It’s the meshing together at the beginning that’s the key then it doesn’t fall apart but even if it does, flip it over and it will still taste good – you just don’t get the masterchef title for presentation!